After a busy couple of weeks, I've been wondering where my self control has gone. Self control for time management, for diet, for exercise, for housework - you know, the little things in life! Which made me think of one rather big problem I have right now... that Cadbury's chocolate sitting in the fridge, mocking me every time I open the door. Alice isn't the only one to be tempted by the lure of "Eat me!". Then there's the ongoing discussion with sweet Lynnette regarding the state of the international chocolate industry - she's on the US M&Ms side of the sweet stuff whereas I'm pure Cadbury's all the way. Which one is better? Both of us consider that WE have the best of course! And last week, Counterfeit Kit Challenge fellow Master Forger, Stephanie, was all over the Belgian chocolates in Brussels, Gent and Bruges! Now, there's a reason to visit Brussels, if ever I needed one! Which brings me to the point... this week, I'd like you to be inspired by chocolate. Love it or hate it? Cant go through a day without it, or is it your Kryptonite? Do you have a children's story about it or maybe you just want to record a few favourites. Be inspired by the brand colours or the wrapper design. I still refer to a particularly gorgeous silk dress of mine as the Cadbury dress because it's the same royal purple. Perhaps you'd like to compare chocolate of today with that of yesteryear. A day out at a chocolate museum or other sweet location. So much chocolate, so little time! Here are a few layouts I tracked down about chocolate of one sort or another. 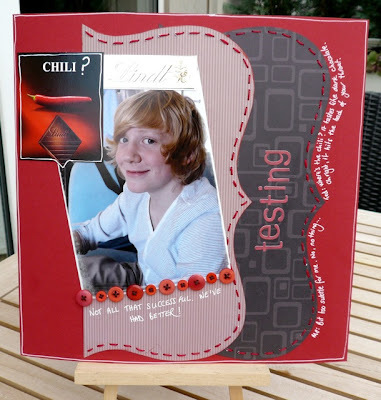 This one is about when Ted and I tested out the child flavoured Lindt chocolate. I came across it yesterday when I was sorting layouts which made me think of it today. Not my best work - not sure if it'll make it into the album or if it'll be relegated to cold storage - but it's a fun memory nonetheless. 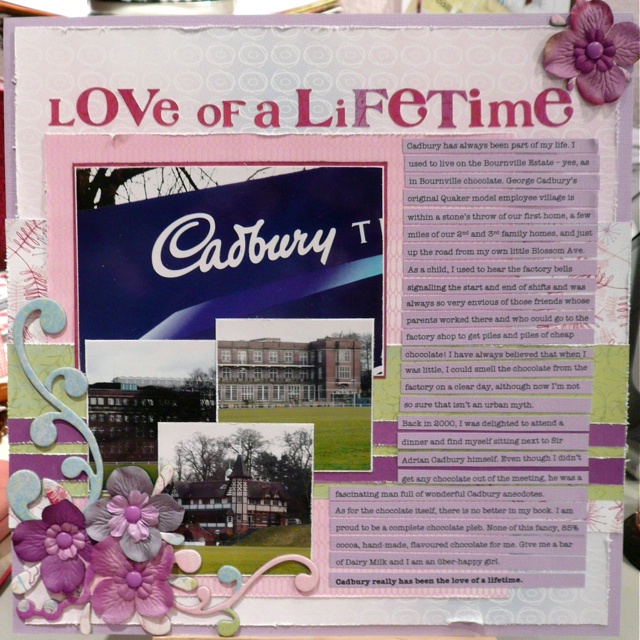 This is, of course, about my one and only chocolate love, Cadbury. Mmmmm. And with some of that difficult to use purple product! 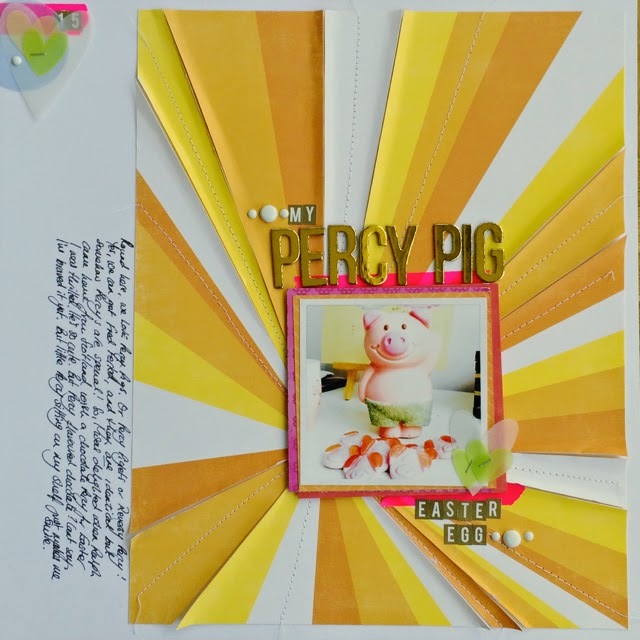 And then there's this Easter's Percy Pig easter egg. The chocolate was awful - bleh - but the whole process was such a lot of fun. I hope you'll share your chocolate creations with us over at the Whimsical Musings Flickr gallery with the tag WM#170. LOL!!! Funny thing is I can pass up chocolate...not a temptation for me at all. We do pledge allegiance to Mars and m&m's, though! Oh my...I don't need much of a push to scrapbook about chocolate, that's for sure! Might need to do a little "research" though, just to be sure I pick the right subject!